﻿ Best Price on Mc Haven Resort in Grande Riviere + Reviews! Located in Grande Riviere, Mc Haven Resort provides barbecue facilities, garden and shared lounge. Among the facilities of this property are a restaurant, a shared kitchen and a tour desk, along with free WiFi. Staff on site can arrange airport transportation. 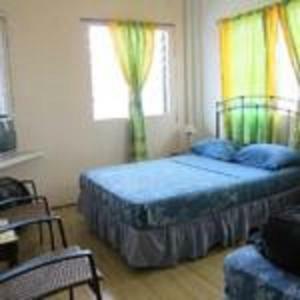 The rooms are equipped with a flat-screen TV with cable channels, fridge, a electric tea pot, a shower and a desk. Rooms are complete with a private bathroom, while some rooms at the resort also provide guests with a balcony. Guest rooms come with a seating area. A continental breakfast is served daily at the property. Mc Haven Resort has a playground.